Wish it were a softer consistency. I add a couple essential oils to the Comfrey Ointment by Christophers Original Formulas. Some times set it on my stove which is warm and this softens it some. 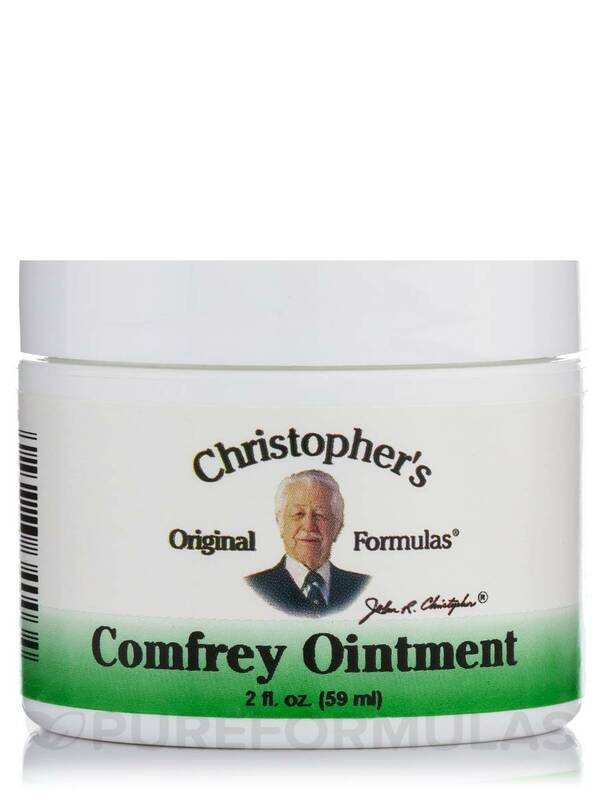 Comfrey Ointment is manufactured by Christopher's Original Formulas® to improve skin health. Comfrey Ointment relieves skin problems. Comfrey Leaf may provide healing effects and reduce swelling when applied to the skin. Comfrey Leaf is high in Calcium and Vitamin C‚ which stimulate healing activity. Some studies show that Comfrey also relieves pain associated with wounds and broken bones. Comfrey Leaf contains the phytochemicals Allantoin and Tannins‚ which help promote healthy skin by rejuvenating skin cells. Some potential benefits of Comfrey Leaf include promoting the healing of bone fractures‚ strains‚ and pulled muscles. Comfrey Leaf possibly speeds the healing of various skin discomforts such as skin rashes‚ insect bites‚ and sunburns. 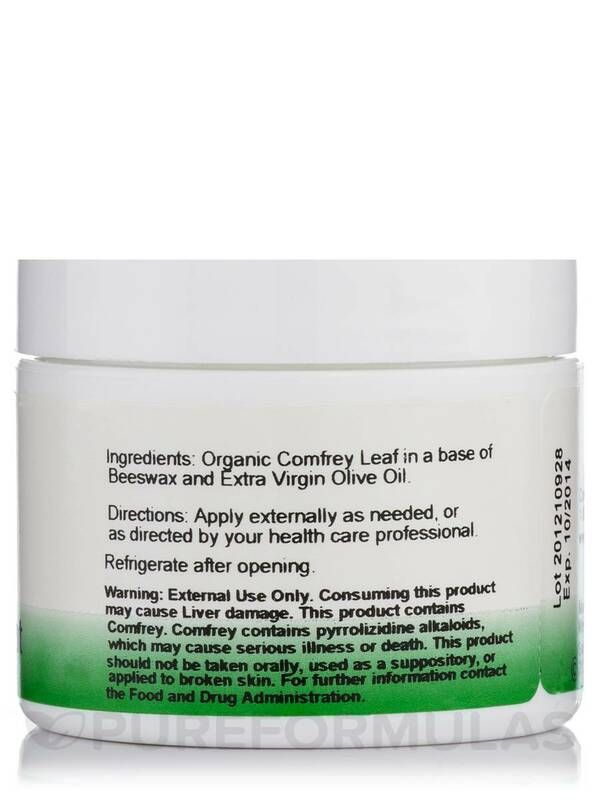 Comfrey Ointment also contains Extra Virgin Olive Oil‚ to provide moisture to the skin. Organic Comfrey Leaf in a base of Beeswax and Extra Virgin Olive Oil. Apply externally as needed‚ or as directed by your health care professional. Refrigerate after opening. External Use Only. Consuming this product may cause Liver damage. This product contains Comfrey. Comfrey contains pyrrolizidine alkaloids‚ which may cause serious illness or death. This product should not be taken orally‚ used as a suppository‚ or applied to broken skin. For further information contact the Food and Drug administration. I heard about the benefits of Comfrey herb and I decided to give Comfrey Ointment by Christophers Original Formulas a try for relief my Lumbar area pain, didn't feel any difference the first 4 days but after that I started feeling better and my pain was reduced dramatically. The paste is kind of hard. I recently had a cast removed for a broken arm. 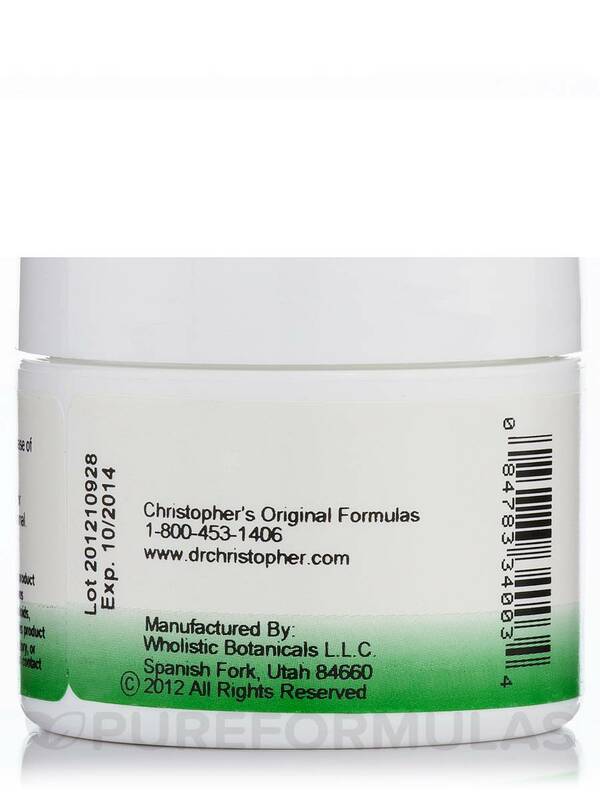 I 'm in physical therapy now and use Comfrey Ointement by Christophers Original Formulas on my arm daily. I'm very satisfied with the results. I'd certainly buy another jar when I run out. My arm feels a lot better after using this ointment. Comfrey Ointment by Chirstophers Original Formulas is used for inflamed skin caused by minor rash. Christopher's Comfrey jar lacks plastic or protective seal around item. Does this product help heal lichen sclerosus? Hello, thank you for contacting PureFormulas. The description for this bottle does not indicate. If you would like you can contact either a health professional or the manufacturer of the product. Can this be used vaginally? I read it is good for menopause vaginal dryness. Thanks. Hello Ellen, thank you for contacting PureFormulas. We suggest contacting your health care practitioner for better assistance.